Tarak Mehta Ka Ulta Chasma is an Indian comedy show that aired on the famous entertainment channel SAB TV. 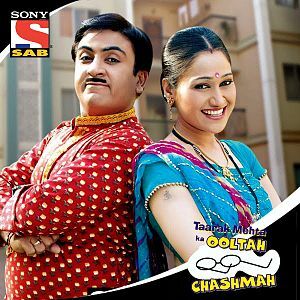 The Tarak Mehta Ka Ulta Chasma show was first aired on 28 July 2008. This show is produced by Neela Telefilms. As per the information this famous show and its title are based on the famous column Duniya Na Oondha Chashmah a Gujrati show. This was written by famous columnist and journalist Taarak Mehta for the famous Gujarati weekly magazine Chitralekha. This show is set in an imaginary Gokuldham Co-Operative Housing Society in Mumbai that had different religious and social backgrounds people live together. This serial aired most number of times (episode) in the world in the related categories of serials. In August 2010 this serial beats the famous serial Balika Badhu to be most watched series in the country. Tarak Mehta Ka Ulta Chasma completed the 900 episodes on 22th June 2012 and becomes the longest running daily comedy show in all the time on Indian television. It has also completed the 1000 episodes on 6th November 2012. And 1100 episodes on 25th March 2013. Neela Asit Modi and Asit Kumar Modi are the producers of this serial. The Director of this serial is Harshad Joshi and Malav Raida. In December 2012 & January 2013 this serial created the big long track by creating the another history as this show got the highest TRPs and got on No 1 position in the 3rd and 4th weeks in all Indian television GEC. Tarak Mehta Ka Ulta Chasma had completed four and a half years on 28th Jan 2013. This show is still the no. 01 family sitcom in Indian Television. I watched a lot of episodes of this famous comedy show and really this is very entertaining comedy show.Almost all of the characters are comedian and really you will love to watch this serial. Tarak Mehta Ka Ulta Chasma aired on SAB TV at 8.30 to 9.00 PM from Monday to Friday. They also repeat the episodes on Saturday and Sunday aalmost whole day for the audiences who did not get the time to watch on Monday to friday. Tarak Mehta Ka Ulta Chasma had got a lot of awards of the best performances in Indian television History. Tarak Mehta Ka Ulta Chasma had number of families like- Gada Family, Mehta Family, Bhide Family , Iyer Family , Sodhi family , Hathi Family and others. A lot of good characters are in this show like- Jetha Lal , Daya , Champak Lal ,Hathi , Bagha , Natu , Iyer etc. These all characters are good. Now its your turn to watch this comedy show and give your comment that which character you like most.